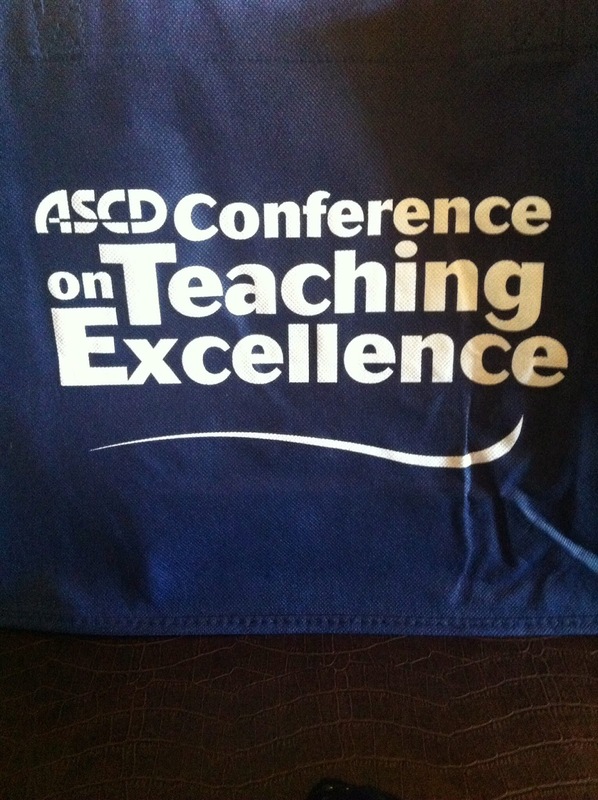 A Lot of Learning at #ASCDCTE14! ~ No Limits on Learning! I was surrounded by great educators. One of my presenters was one of Benjamin Bloom's students, yes that Bloom. I've been fortunate to see Carol Ann Tomlinson before, and I am in awe of her wisdom and thoughtfulness about differentiation, and I am captivated when she speaks. Her keynote brought tears to my eyes. One of my presenters was her student, and she was also just as incredible! I also saw a mind-blowing presentation by Jane Pollock, one of the co-authors of Classroom Instruction That Works, so I guess she's one of Marzano's BFFs. ...however, I learned that just because a person holds multiple advanced degrees and is an educational consultant and author, it doesn't necessarily mean that s/he is an earth-shattering presenter. Most of my sessions were fantastic, but I heard other comments that were not so great. I was surrounded by great educators part 2. All of the participants seemed to be amazing educators too, and that was just as energizing! I met professors, administrators, instructional coaches, curriculum directors, and teachers...all who were excited to learn and find ways to help students succeed. I don't think I've ever attended a conference that had so many out of state and international visitors. The people from New York were not happy with our heat and humidity, and the principal from New Zealand said it was snowing back home. Gotta love summer in Texas. This conference was definitely not tech-y, which was rather interesting and refreshing. In February, I attended the TCEA (Texas Computer Education Association) conference, and it was almost impossible to meet people because everyone was glued to his device. During past conferences, I always loved visiting with people at my table, in the hallways, waiting for the next session...but when you're at a tech conference, we're sometimes too engaged with our social media, etc. to have conversations. At this conference, however, we saw "regular" power-points, and we were never asked to use back channels, poll everywhere, or any other tech response system. We engaged with our neighbors, and I loved the face-to-face conversations! There were only a few sessions devoted to technology, but I chose to attend presentations about formative assessment, grit, differentiation, coaching, etc. You chose either 90-minute or 3-hour sessions, which meant in 2.5 days, you didn't have time for a lot of presentations. At first, I wanted to attend more sessions, but with that amount of time, you really had more opportunities to learn deeply, process, and engage with those around you. Thumbs up! I've already blogged about my first session, which was on Fostering Grit; it also coincided nicely with tonight's #eduread. So one quick take-away of something new and tech-y: a teacher shared info about the site http://dropevent.com/, and it's a place where you can quickly upload pictures to a shared site. (The site is really for parties, weddings, events, etc.) You can create an "event," and anyone can share photos by emailing to a specified address or posting them on the site. The event expires after 6 months, but you can download all of the pictures before they expire. If you want to practice and see how it works, feel free to upload a picture to my "Testing" event: http://dropevent.com/gallery/pho56503 . My first idea for how to use this is for our site-based staff development. I could have our new teachers take selfies in the morning, and we will all have pictures of each other and of the day (and important building locations.) I might also have our teachers take pictures of their classrooms or favorite parts of their classrooms, and then we would have a collection of all kinds of cool classrooms. For a class, I thought we might take pictures of work, projects, or even daily notes and submit them to the site. In math, we could ask students to find a picture of a __________ (scalene triangle, parent function, graph in a newspaper, polygon...) and upload the photo before the next class period. You do have the option to moderate the pictures before they are posted, and I would definitely take advantage of that restriction with my classes.